In your wildest imagination, could you ever imagine inviting your pet bunny to watch the moon with you? 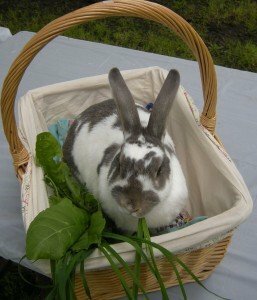 Do you know anyone who talks to a pet rabbit about eating Brussels sprouts? Do you know anyone who plays hide and seek with a rabbit? If you have loved and/or lived with rabbits, none of the above might surprise you. Perhaps you know that these small animals are capable of doing big things. You may have spent time getting to know hares, and have first hand experience witnessing their complexities. The first time that I heard about rabbits engaging in play, was from a friend whose rabbit loved to chase the family dog around the sofa. So, the concept of IT playing hide and seek with a rabbit was not such a big stretch for my mind. I still love the rabbit story that was told to me a very long time ago. It makes me laugh every time I tell it. This is how it was told to me. A man built a cardboard house for his wife’s pet rabbit. Years later the man noticed that the rabbit house looked raggedy so he took it upon himself to build a new one for the rabbit. His wife tried to dissuade him. “Maybe he likes his house and doesn’t want a new one.” The man wasn’t persuaded, and destroyed the rabbit’s old home. During a recent interview, Dwyer shared some of her “rabbit” wisdom.” Dwyer was nine years old when she got Fluffy her first rabbit, from her brother-in-law. She had no idea how to care of this bunny. She would later come to understand and appreciate the complexities of these small animals. This was all that Dwyer needed to bring this little one home with her. She had no way of knowing what a teacher this little animal would be, doing things that seemed bigger than his size. Poco could jump over screens and up stairs. He would like to sit beside her on the sofa. Dwyer could say “Poko let’s say goodnight to Mr. Moon” Poko would poke his head under the drapes at the glass door, and the two would look at the moon together. Dwyer noted what she called “a sense of humor” when in a playful way Poko seemed to know when she wanted him to go into his cage and sleep. She placed food inside and then closed the cage once Poko went in to eat. As Poko got older, he would reach in just enough to grab the food and back out. He decided when he was ready for bed, and when he would allow her to close the cage. Dwyer provided additional information about these popular pets with her answers to the following questions. What would you like people to know about rabbits? Rabbits are as intelligent as you expect them to be. When asked to explain, she expounded. We tend to treat and respect animals based upon our ideas and expectations of them. If you think that a rabbit isn’t very smart, you might treat it differently than if you believed that it was highly intelligent. Please don’t assume that rabbits aren’t intuitive and highly intelligent because they are quiet. They can be high spirited animals. They have their ideas and personalities and are as individual in as many ways as humans are different. Therefore labeling all rabbits is as unproductive and misleading as it would be to describe all people as having the same characteristics and personalities. Like humans, they have varying levels of intelligence, curiosity, humor, energy, etc. 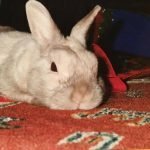 In what ways are rabbits difficult pets? They are geographically potty trained. They will go back to the first place that they went to the bathroom. 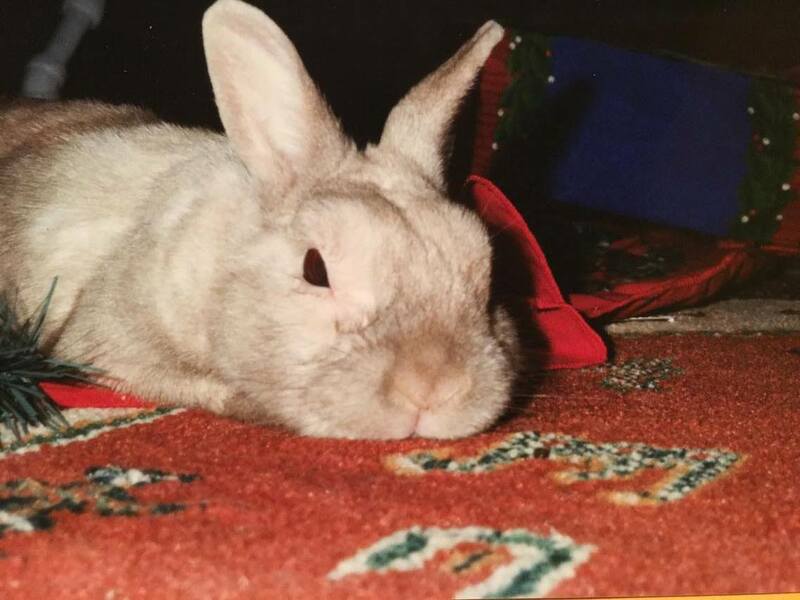 Unfortunately for my family, my first rabbit went to the bathroom under the kitchen table and no amount of coaxing could retrain her. My family put a mat under the litter box which was placed under the table until company visited. The two were quickly removed and brought back and placed under the kitchen table for the benefit of the beloved rabbit. 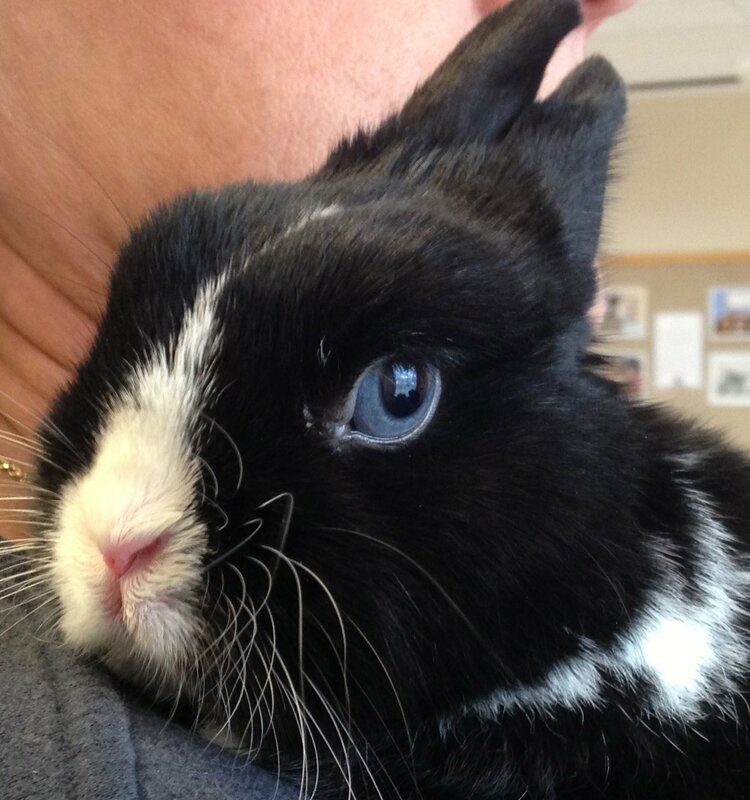 What suggestions do you have for families who want to bring a rabbit into their lives? 1) Rabbits scare easily. Don’t ever back a rabbit into a corner. If you notice your rabbit sitting in a corner, let the rabbit come out on its own. 2) A larger rabbit may be more appropriate if you have young children at home. Young bunnies are rather fragile, and young children may unintentionally harm them. 3) Do your research before choosing a rabbit so that you choose a breed that is appropriate for your family. Do you think that rabbits understand your words? Absolutely. I had a rabbit named Mattie. I called her my culinary rabbit. She would follow me into the kitchen and I would give her food One day I said to her “Mattie you have never tried red pepper. Let’s see if you like peppers. Mattie waited to receive the peppers and as she had done with brussel sprouts and other vegetables. How do you communicate with rabbits? If I want them to do something, i send a mind picture of what I want them to do. So, if I want a rabbit to go outside, I might picture the back yard. A rabbit person, in my mind, is a listener. Only by listening, relaxing and soaking in the bunny’s ways can we hear them. Once this is practiced and done a lot-we realize they speak loudly! Previous Article Previous Article: Listening to the quiet voice within-They Have Organic Chicken Manure! Next Article Next Article: A Dose of cuteness. Four Legged one lifts spirits. Few can resist smiling! How about you?